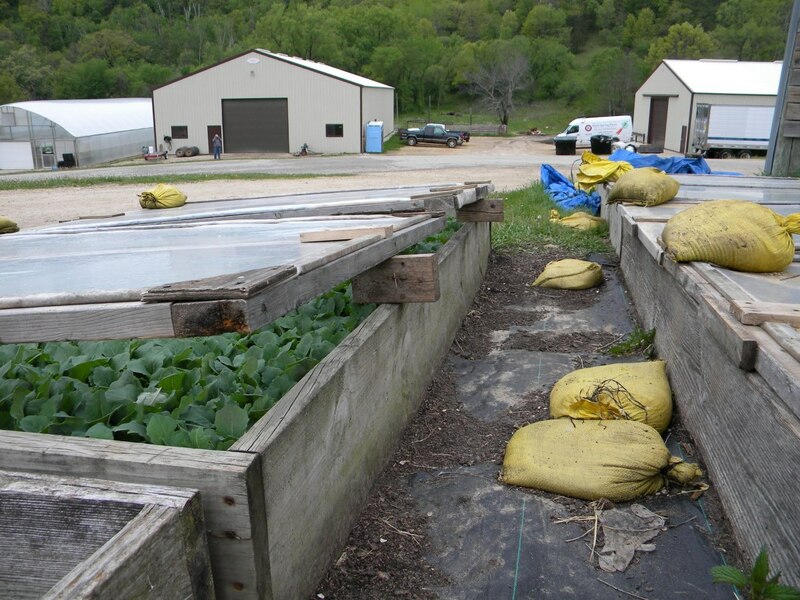 This project was funded by the Leopold Center for Sustainable Agriculture as part of a grant to the Iowa Organic Association. Read the final grant reports. 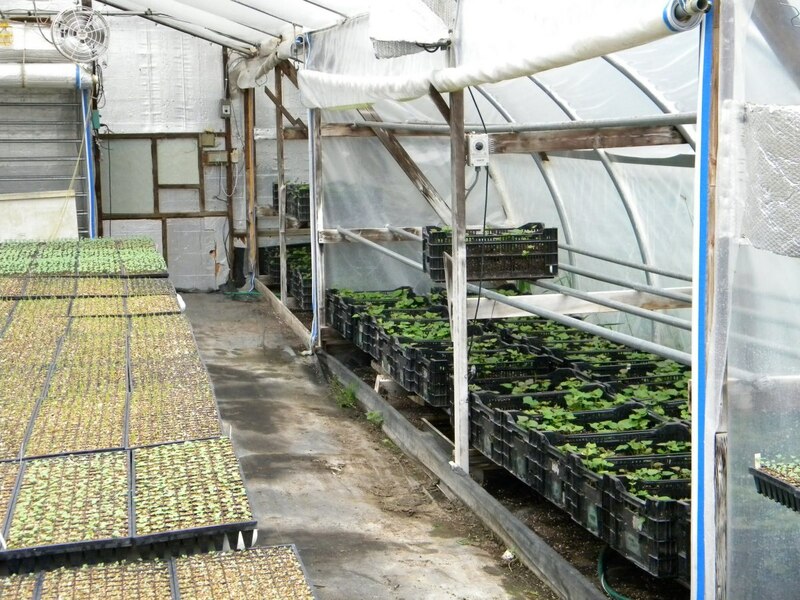 Vegetable transplant production provides a critical jump on the production season and mitigates risk by providing a controlled environment for germination and young-plant stages. This allows growers to achieve solid stands of crops and to avoid pests which can damage tender seedlings. It also reduces risks in stand establishment and weed control, as well as providing a reliable method for season extension in Iowa and the Upper Midwest. The choice of equipment and supplies used in producing transplants can affect the profitability of the transplant production enterprise. As the scale of a vegetable operation increases, the amount of work that goes into transplant production also increases. Much of the work in the transplant house requires attention to detail and a certain level of skill. Large plantings can create large workloads that need to be completed in a short period of time. The Transplant Production Decision Tool provides information and options to organic and conventional market farms in the Upper Midwest as they scale up to meet the increasing demand for local and organic produce. 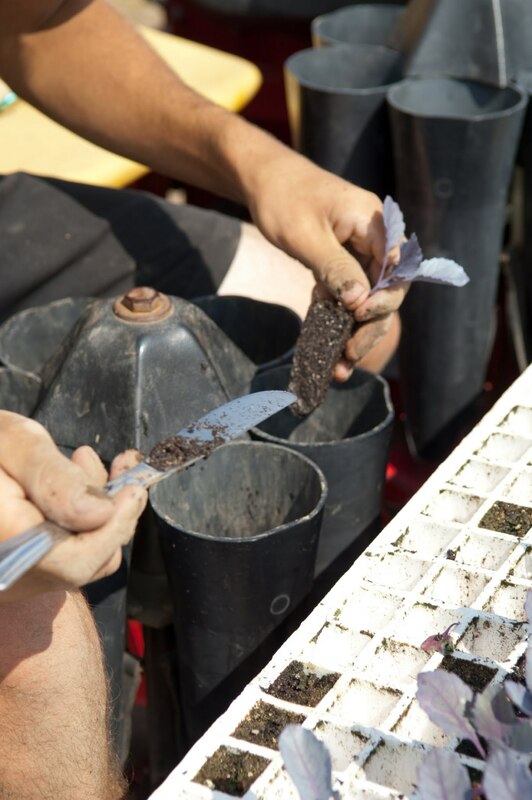 This tool looks at the options available in several phases of the transplant production process: Growing Trays, Seeders for Transplant Production, Germination Tools, Benches, Irrigation Tools for Transplants, and Setting Out in the field. The following discussion of different elements of a transplant production system treats each step in the process as distinct. 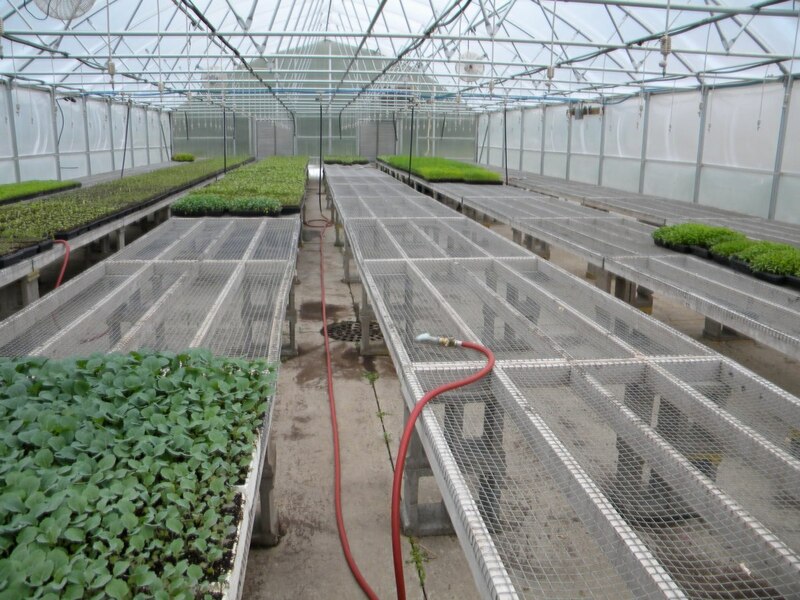 However, the system of transplant production, from the choice of growing trays through the equipment used to set the transplants in the field, exists as a series of connected choices that have an impact on each other, and are impacted by the scale of the operation using them. Work in the transplant house starts at a slow time of year for most vegetable growers, but the pace rapidly accelerates as field operations get under way. A few well-selected tools can facilitate the efficient use of labor as farmers get their crops ready to hit the field. 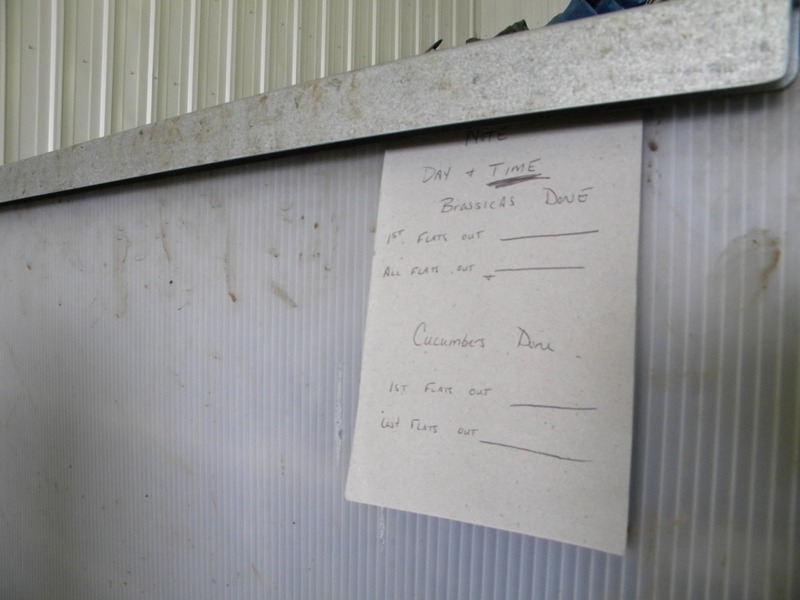 Growers need to carefully evaluate potential cost savings by tracking the time involved in current methods. In general, published rates of speed exaggerate the potential time savings on a small, diversified vegetable operation using seasonal labor. Growers also need to consider opportunity costs when evaluating potential improvements in efficiency: if a farm ties up key equipment or labor in the production and setting out of transplants during the only dry week of the month, those resources are unavailable to perform other key tasks. The choice of growing trays for transplant production will depend on the scale of the operation, the amount of greenhouse space available, and the flexibility needed in setting out crops. Small cell sizes increase the utilization of space in the greenhouse, but require more precise management of fertility and timing. Organic producers may need a larger cell size in general because of the relative difficulties of supplemental fertilization in organic systems. 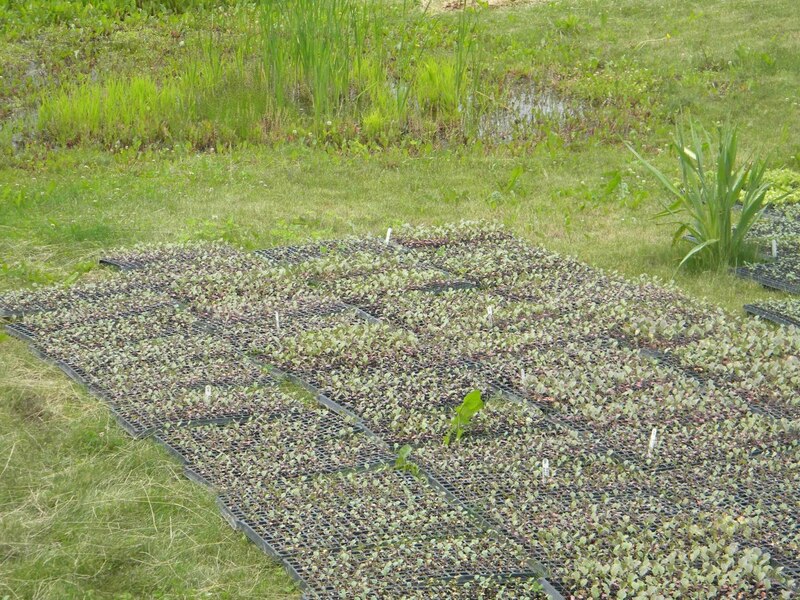 1020 trays (10 inches by 20 inches) are the dominant size used in garden center production, and are the most widely available in lightweight, inexpensive trays. 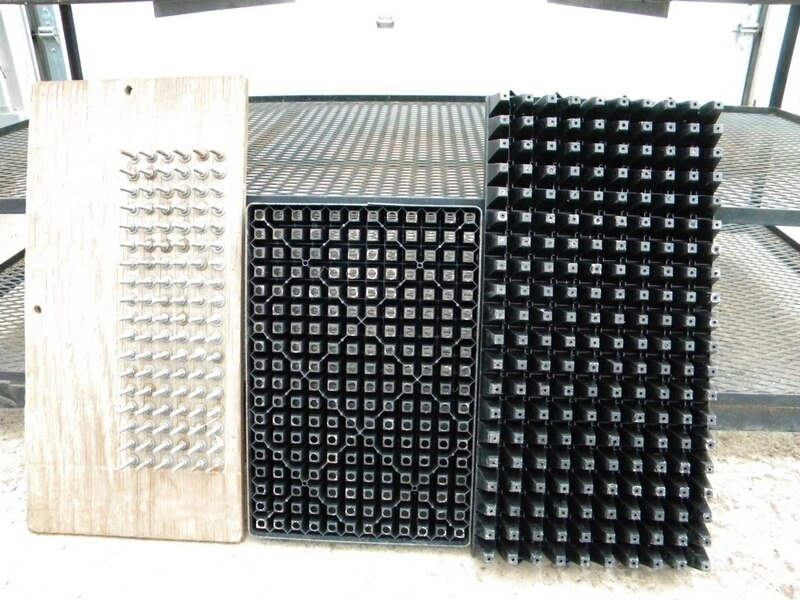 1326 trays (13 inches by 26 inches) are commonly found on larger Midwest market farms. They feature the obvious advantage of moving more plants every time a worker picks up a flat or manipulates it in another way. This size is often referred to as “Speedling-size,” after the brand of polystyrene trays that gained popularity and remains a cornerstone of California and Midwest transplant production. Plantel-style trays (9 inches by 26 inches) are another common size for long-lasting rigid trays. Within a given size of transplant trays, the next measurement comes in the form of the number of cells in the tray. Of course, a 200-cell 1020 tray has a lot less space per plant that a 200-cell Speedling-style flat. Measurements that describe the amount of space a plant has to grow include the center-to-center distance from cell to cell, as well as the volume of soil available for the rootball. Larger organic producers in the Midwest seem to rely on a 1-inch spacing with 24-35 cubic centimeters of soil per plant for most of their production; poorly-rooting crops such as parsley and multi-plant onions are commonly grown in cells with about half that volume of soil. Growers often discuss cell size in terms of the number of cells per tray, but this is not an absolute indicator. One grower interviewed experienced wide variation in soil volume between one manufacturer and another. Most growers interviewed for this project use rigid, injection-molded polypropylene trays for transplant production. These trays are relatively expensive, ranging from $8 to $14 in cost depending on size and configuration. Less expensive, vacuum-formed plastic flats are less rigid, and generally lower in soil volume. These flats, which many growers reuse but which are designed as a disposable item, cost $1 - $2 each. 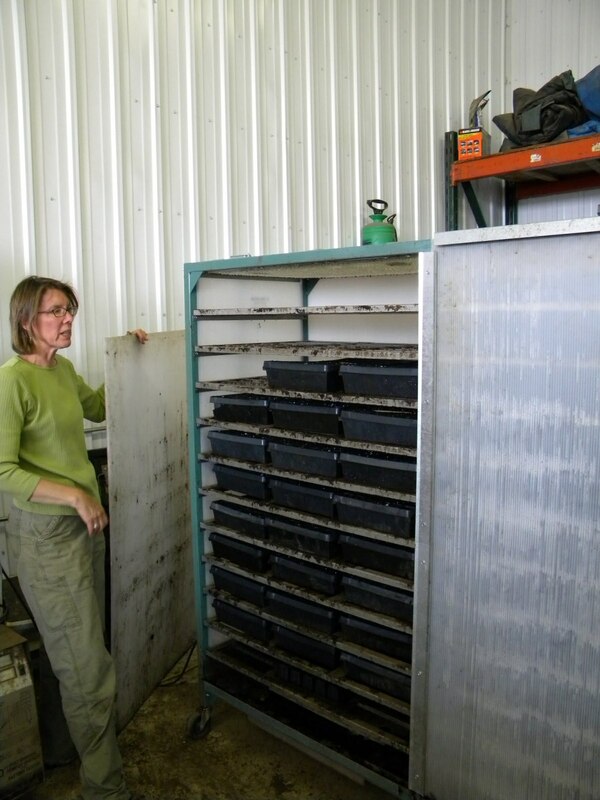 Trays are designed to either stack or nest and some trays are designed to stack when filled with soil. Nesting rigid plastic trays increase storage capacity by 100-150 percent. 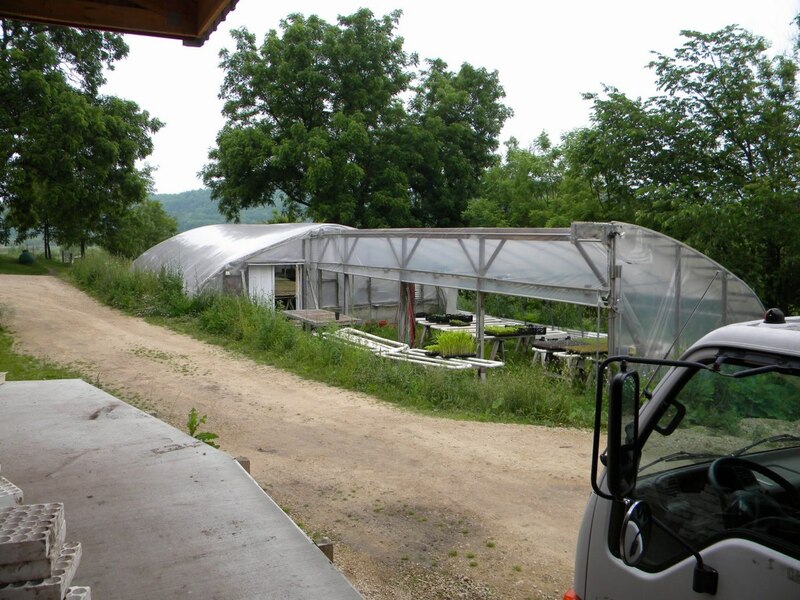 Flat sizes can have an impact on other greenhouse systems. Equipment is universally available and adapted to the 1020 flat configuration; 1326 and Plantel trays may not fit in germination chambers and transplant machines. Sources: Injection molded trays are frequently manufactured overseas. They are cheaper by the pallet and by the trailer-load, so cooperating with other farmers and ordering well in advance can reduce costs, and may be a necessary part of sourcing these items. Plantel Trays - Plantel offers injection-molded, durable trays in a 9-inch by 26.5-inch configuration. 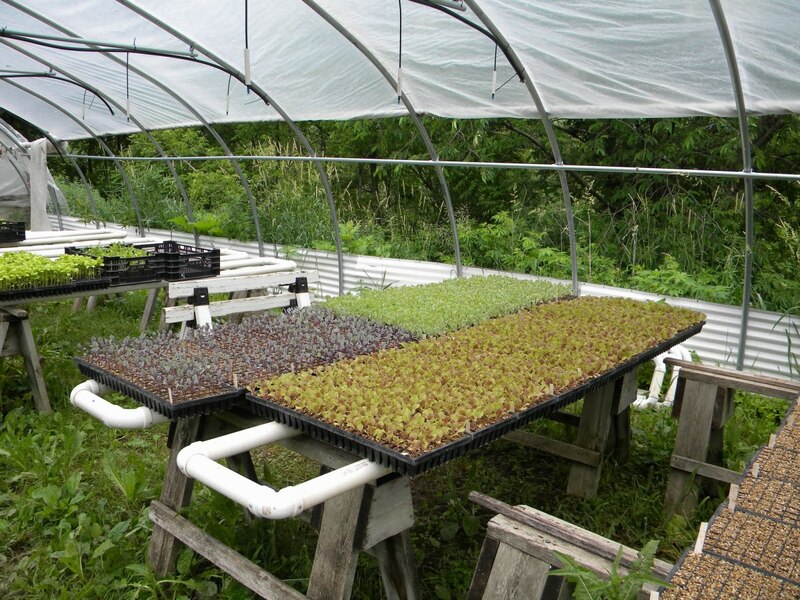 These trays are available in small quantities from Peaceful Valley Farm Supply. Proptek – Proptek manufactures injection-molded trays in a variety of configurations. Plantway - Plantway offers injection-molded trays in a variety of configurations. Local nursery suppliers offer vacuum-formed trays from a number of manufacturers. These websites are provided as a resource and are not an endorsement of products or retailers by the Leopold Center for Sustainable Agriculture or the Iowa Organic Association. 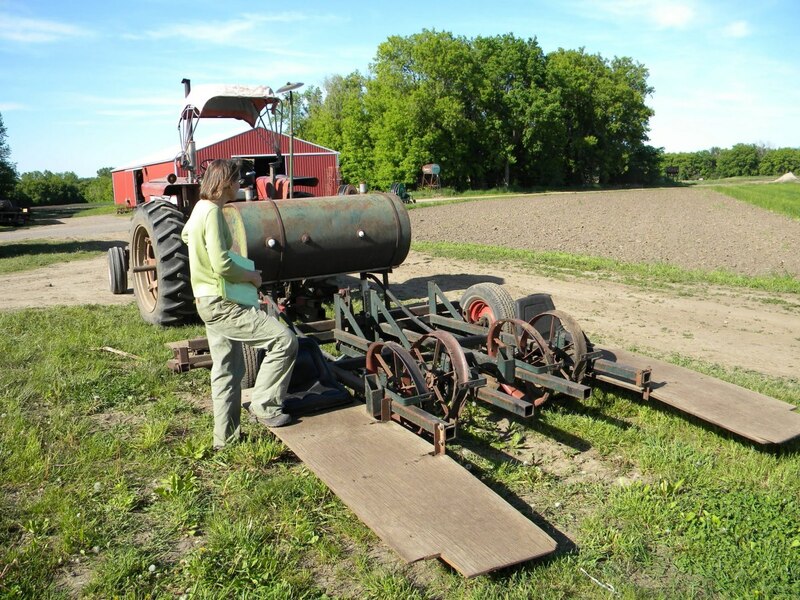 Farmers use a variety of seeding tools to speed this labor-intensive process. Seeders vary in the speed of operation, their suitability for different types of seeds, and the degree of skill required for operation. Vibrating Wand Seeder: The Vibro Hand Seeder resembles a flashlight with a long wand extending from the power source. The seed sits in the wand. Automatic vibration causes the seed to roll off the tip of the wand. The vibration speed is adjustable to control the speed of the seed movement. Cost is around $63. Plate seeders use a vacuum to hold seeds onto a flat plate drilled with small holes to match the seed size and pattern of cells in a tray. 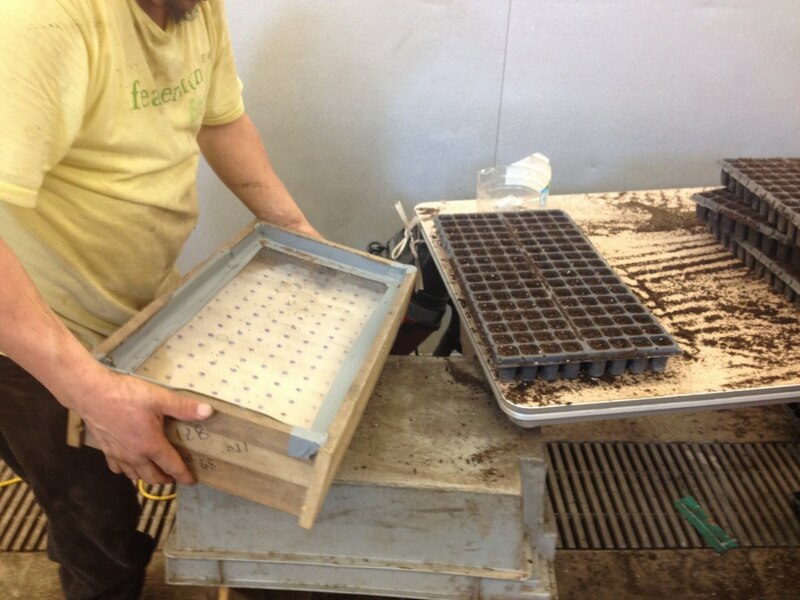 Seeds are poured onto the plate and moved around the tray until all of the holes are filled. The plate has a lip around it that keeps the seeds in. Once all of the holes are filled, the remaining seeds are poured off, or maneuvered into a seed channel attached to the seeding plate, depending on the model. 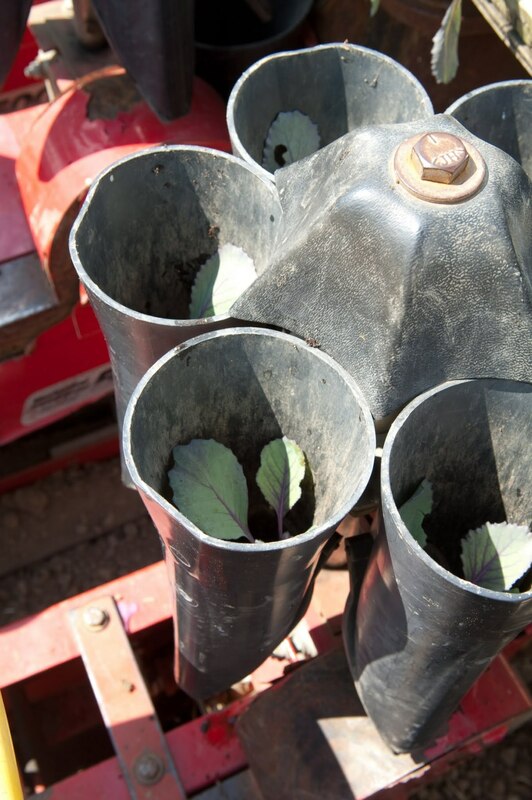 Plate seeders work best with round seed, such as brassicas. With irregular seed, such as onions, results can be inconsistent, as multiple seeds can clump up on each hole. Plates must be drilled to match the pattern of cells in the flats. 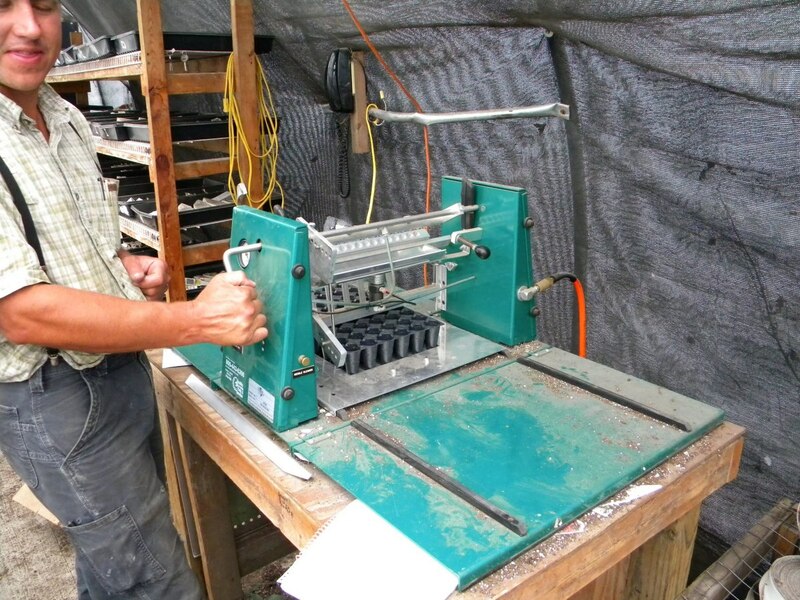 Carolina Greenhouses and E-Z Seeder both manufacture plate seeders in use in the Upper Midwest. Seeder prices range from $665 to $850; individual plates range from $73 to $352 depending on the number of holes required. 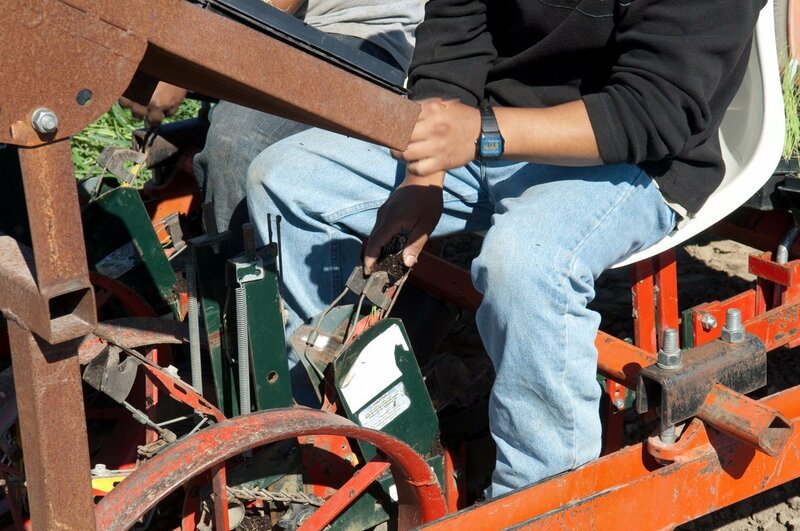 Plate seeders must be sized to the planting tray. Rates cited for seeding by manufacturers range from 120 to 300 flats per hour, but iInterviewed growers indicated slower rates. Setting up the plate seeder for a batch of seeds is simple and doesn’t take much time; operating the machine is a low-skill task. These factors make it a suitable way to speed up seeding on small, diversified operations. Needle seeders use a vacuum and thin needle to pick up seeds, and seed them one row at a time to a seedling tray. Seed is placed in a vibrating v-shaped tray that spans the width of the flat. The vibration keeps the seed spread evenly in the tray. Thin-tipped needles are dipped into the tray and pick up one seed each. 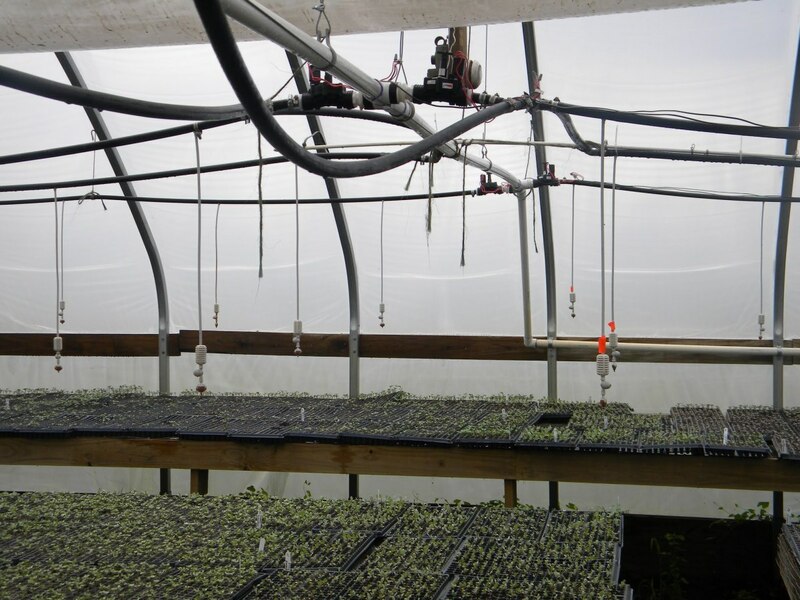 The needles are lifted up to a row of clear plastic tubes, and released into the tubes (the Seederman can eject seeds with a small puff of air). 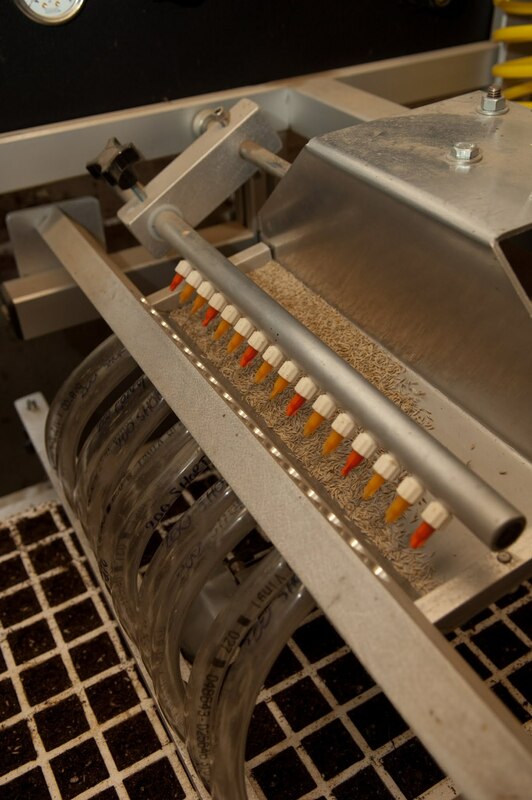 The tubes align with the cells of the tray, so the seeds drop into the cell. 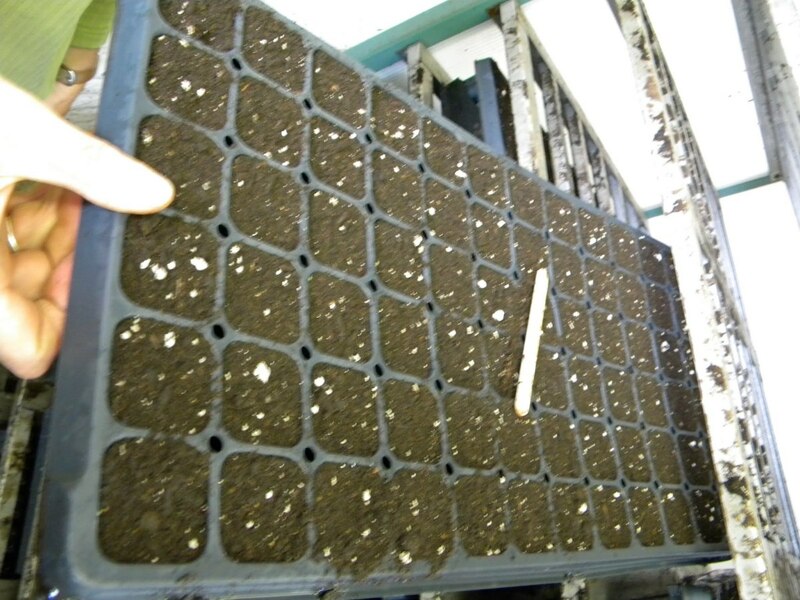 The planting tray is advanced one row, and the process repeated. Needle seeders have a variety of adjustments, including needle size, vibration speed, suction pressure, ejection pressure, indexing (how far the tray is advanced), and tray width. Needle seeders have a better ability than a plate seeder to handle odd-shaped seed because the needles can get into crevices and concavities of the seeds. Switching needles and drop tubes to accommodate new seeds and/or new flats requires about five minutes for a trained worker. with round seed such as brassicas. Prices for needle seeders designed for smaller growers range from $2,750 to $10,000, depending on the features and degree of automation desired. Setups for additional tray configurations cost extra. Carolina Greenhouses - Manufacturers of the Speedy Seeder, available in both 1020 and 13/26 configurations. Seed E-Z Seeder - Manufacturers of the E-Z Seeder, designed for a 1020 configuration. Seederman - Manufactures the Seederman needle seeder, a high-end needle seeder with options for automation. Bouldin & Lawson - Manufacturer of the Compact Needle Seeder, an entry-level needle seeder. These URLs are provided as a resource and are not an endorsement of products or retailers by the Leopold Center for Sustainable Agriculture or the Iowa Organic Association. Vegetable crop germination requires consistent water. While all crops benefit from additional heat when germinating, some crops require it. 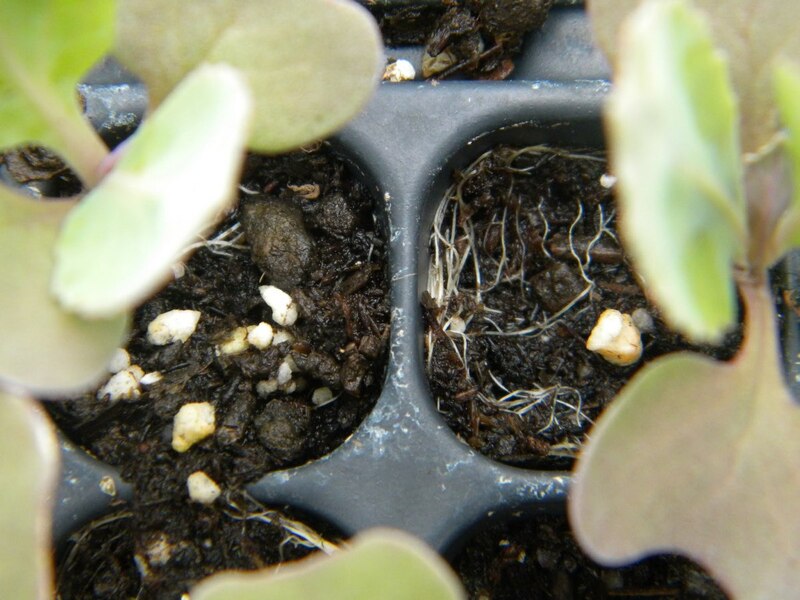 Germination considerations include energy efficiency in providing a high-heat environment and light to prevent leggy plants. Heat Mats: In general, heat mats have relatively high cost and a relatively short lifespan. 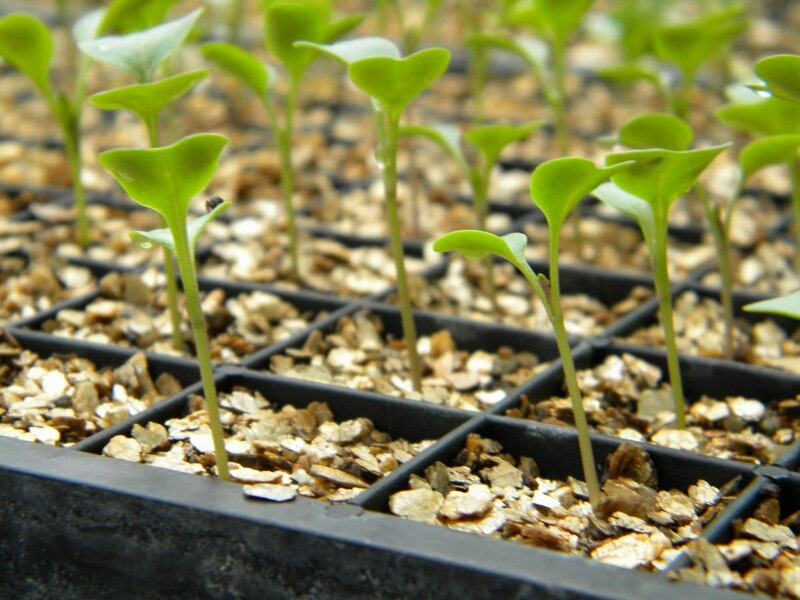 Like a hot water system, they have the advantage of ample light for germinating crops, so that the “stretching” of seedlings is not a big issue. 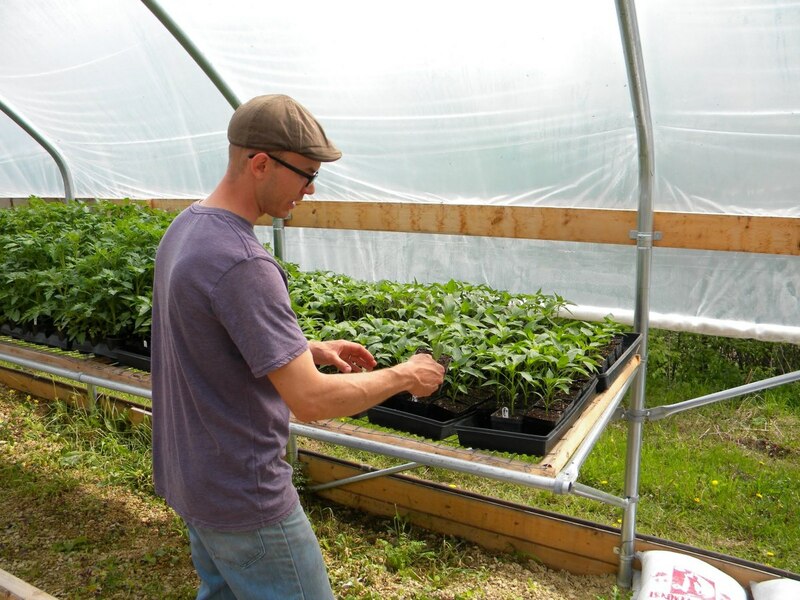 At River Root Farm, Mike Bollinger rolls a cover over his small heat mat to conserve heat and moisture. 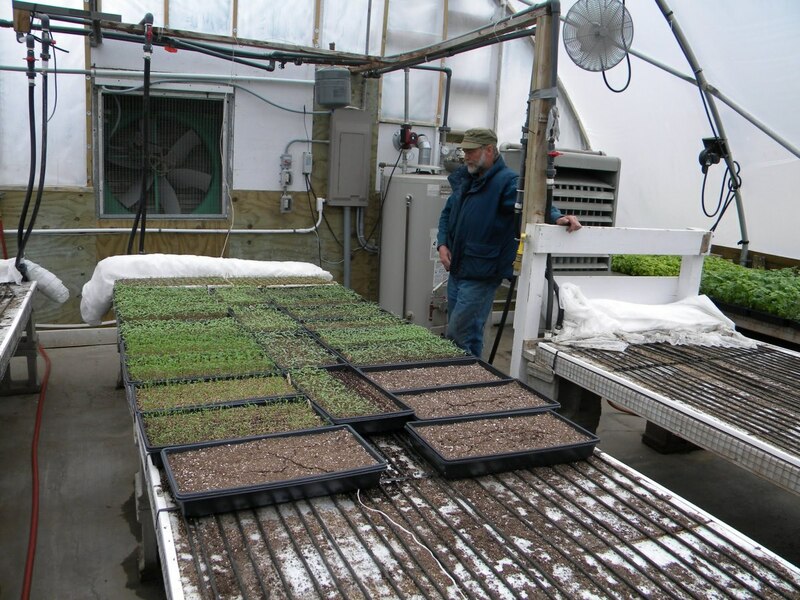 Germination Chambers: At Vermont Valley, the Perkins family built an insulated rack on an endwall of the greenhouse. An electric hotel pan provides heat and moisture into the 8-foot wide by 7-foot tall enclosure. The walls of the enclosure are insulated with foil-backed polystyrene. Heavy metal pipes run the length of the enclosure to hold the flats. The front of the enclosure consists of a layer of foil-lined bubble wrap that rolls up to provide access; the bubble wrap seals to the frame of the enclosure with Velcro. 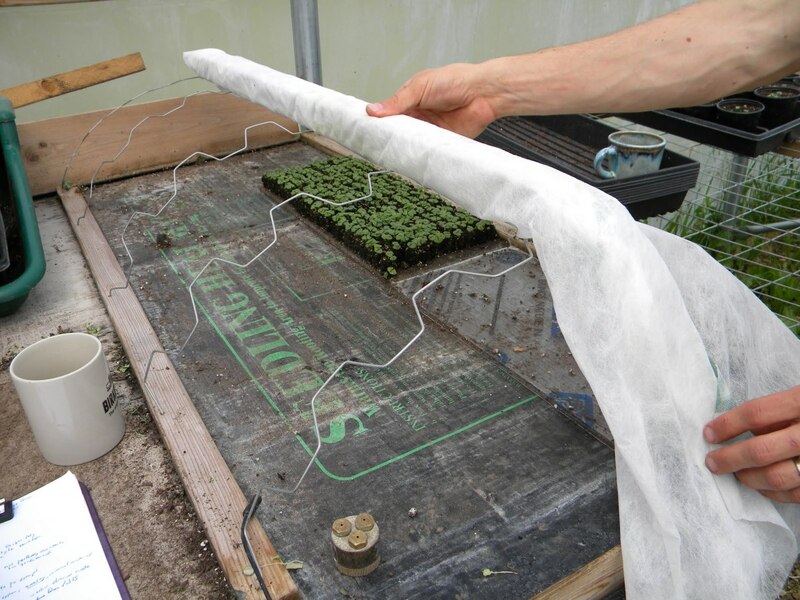 Germination occurs in complete darkness, then flats are moved to a second warm and moist area of the greenhouse created by walling off one edge of the greenhouse with polyethylene sheets. This provides a light-filled area where tender plants can get a solid start. Having a lighted area with additional warmth also provides a way to compensate for uneven germination. Pipe racks in this area allow for additional capacity, although they are spaced much further apart than the racks in the germination chamber. At Tipi Produce, Steve Pincus and Beth Kazmar use a walk-in closet in a portable building as a “glorified germination chamber.” An electric heater provides heat and a humidifier keeps things from drying out. Transplants are removed once the radicals start to break out of the seeds. Steve notes that it’s better to remove flats too early than too late. In their greenhouse, one bench has the hot air from the heater directed under it. The undersides of the bench are clad with plastic so that the hot air is forced up through the flats. 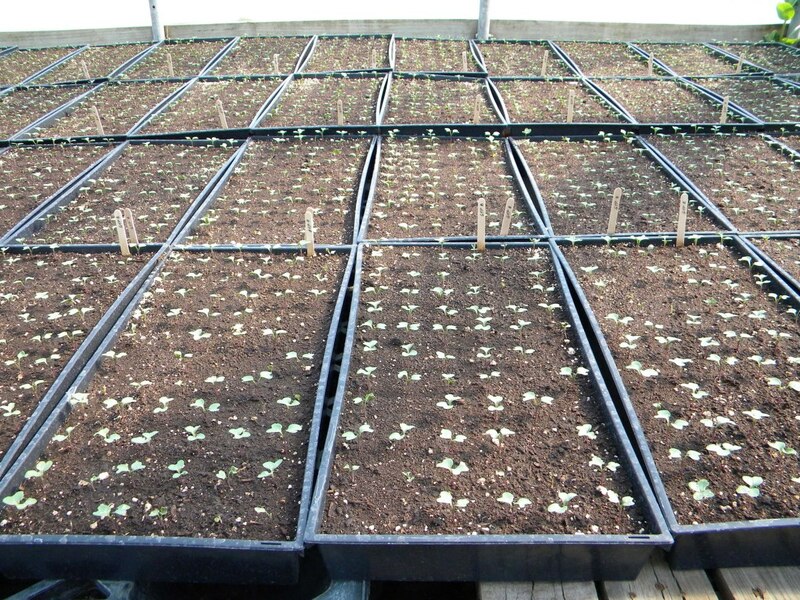 This provides a good nursery environment for getting tender plants off to a good start. 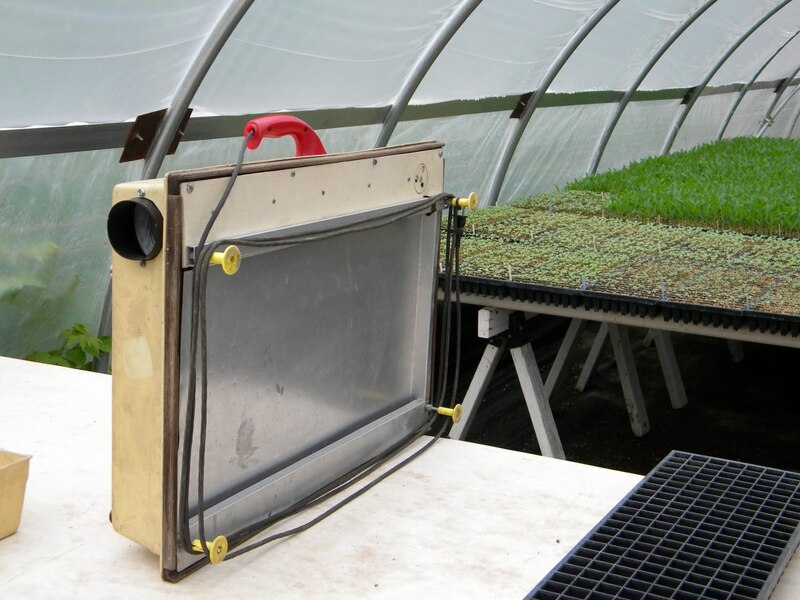 Seed E-Z Seeder chambers are built out of twin-wall polycarbonate and steel, hold 96 1020 flats, and utilize a hot water pan in the bottom of the chamber for heat and the maintenance of humidity. 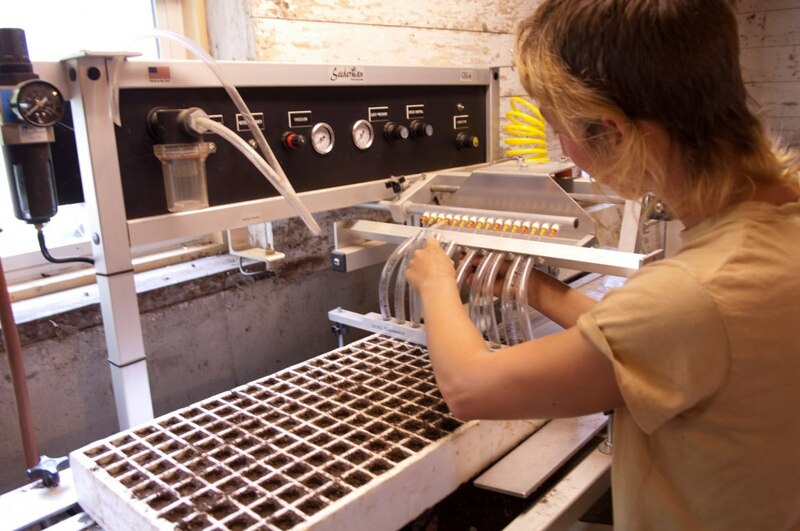 The Seed E-Z Seeder germination chamber costs $3,700. It is worth noting that organic growers may need to pay more attention to the weight capacity of shelving units in germination chambers, since compost-based potting mixes weigh significantly more than peat-based potting mixes. 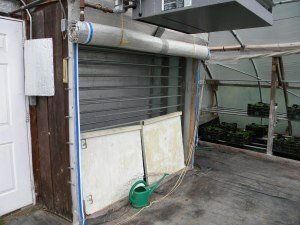 Delta T System Rubber Tube System: Germination benches in the nursery house are topped with foam board insulation and 0.3-inch rubber tubing that carries hot water underneath the plant trays. Tubes are spaced at about 2.5 inches, and are held in place with a spacer placed at intervals along the length of the bench. This system has the advantage that seedlings are exposed to light the moment they emerge from the soil, which helps plants stay stocky. Seedlings germinated in the dark can quickly become leggy, especially under high-heat conditions. One-inch manifolds, cut to the width of the benches, carry water to the tubing. Delta T Solutions does not sell systems directly. Stuppy Greenhouse is a Midwest supplier. Carolina Greenhouses - Offers 24- and 48-flat germination chambers for 1020 flats. Seed E-Z Seeder - Seed E-Z Seeder manufactures a 96-flat germination chamber for 1020 flats. 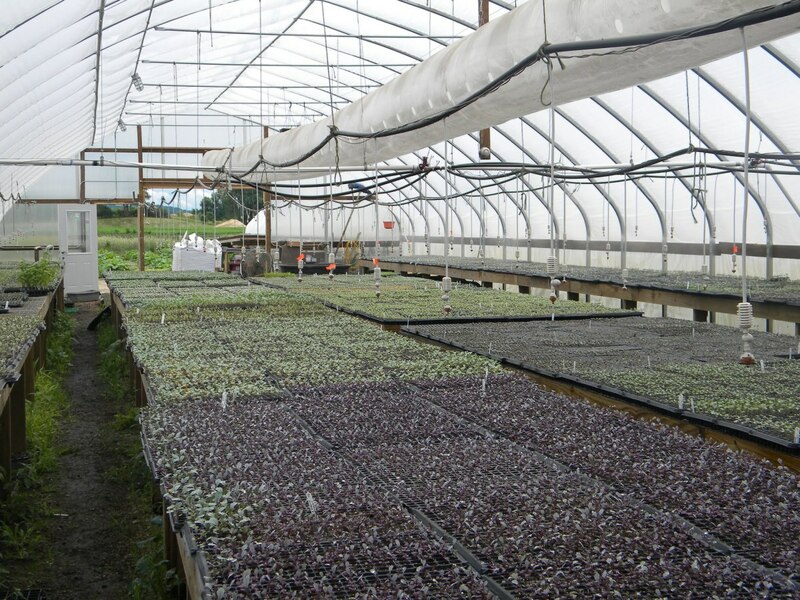 Heat mats are widely available through greenhouse supply houses and seed retailers. Elevating plants above the ground allows for the presence of air underneath the growing tray. This helps to “stop” roots at the end of the cell, resulting in increased root branching and improved transplant establishment. Benches also provide a thermal break between the ground and the potting soil, improving transplant performance in houses with unheated floors. Pallets: The lowest-cost system seen in this project used pallets set on the ground over landscape fabric. While inexpensive, this system allowed for airflow underneath the trays, and elevated the trays enough to avoid accidental kicking by an errant boot as workers walked down the aisles. Pallets set directly on the ground do not improve worker ergonomics and leave seedlings more vulnerable to rodent damage. Lumber benches: Most growers utilize some form of manufactured wooden benches. Designs can be specific to the needs and systems of individual farms. 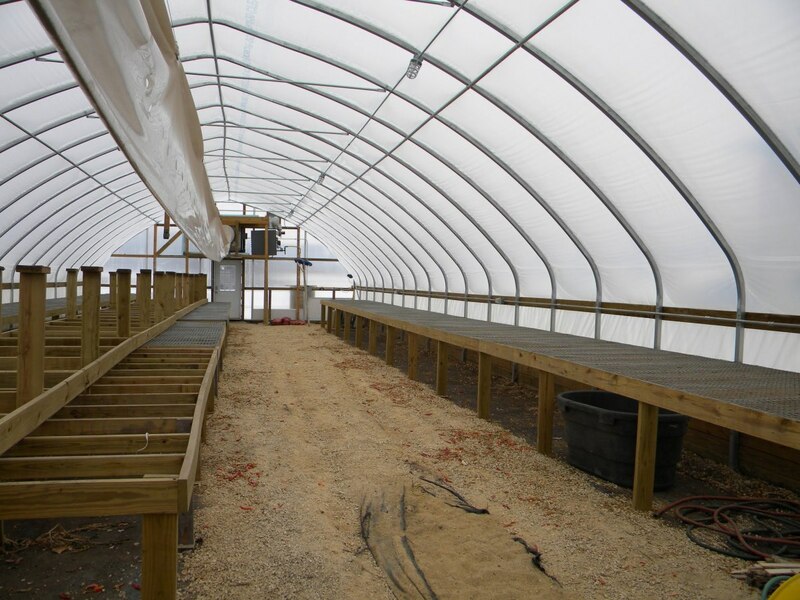 Harmony Valley Farm used long, narrow benches constructed from 2 x 4 lumber and covered with a 1-inch metal mesh. The benches were set on cinder blocks to elevate them above the concrete floor in the transplant house. The benches used plenty of supporting pieces within the wooden frame to provide adequate support to keep flats level. Benches can easily be removed from the greenhouse because the legs are not attached. 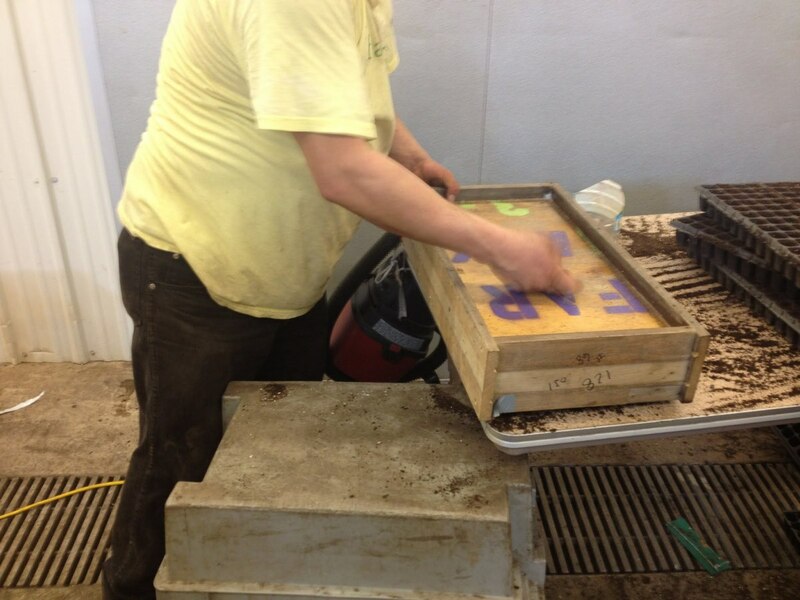 PVC: Vermont Valley, Blue Mounds, Wisc., used narrow PVC benches set on sawhorses to support their transplant trays. 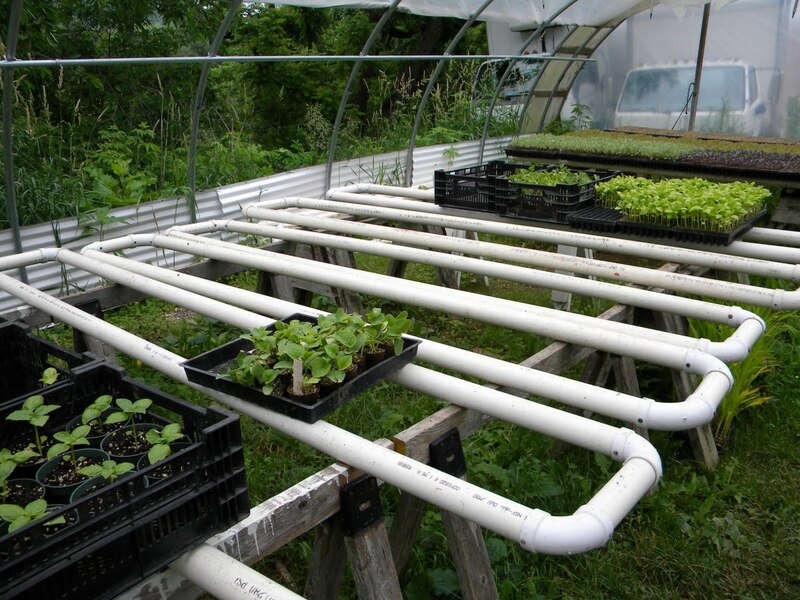 The long, rectangular frames are made from 2-inch PVC pipe and 90-degree elbows, sized to support a growing tray were laid across the frame. The 10-foot long frames hold 13 of the Plantel growing trays. This system allows for easy breakdown and reconstruction of the transplant racking. It is important to use small screws to hold the elbows and the pipe together. PVC glue will not hold up in the high-light, high-movement environment of the greenhouse. Water plays a critical role in transplant production, but watering takes time and careful attention to detail. Automatic watering: On a diversified farm, use of an automatic watering system requires extra care in order to not compromise the quality of the transplant production. The overhead irrigation can be computer controlled, with user inputs and adjustments made on a daily basis for each bench depending on weather condition and plant sizes. Each greenhouse bench can be set up as a separate “station,” and can be set to run for different running times. Costs for watering systems vary considerably according to the size of the house and the degree of automation. Hand watering: Many operations rely exclusively on hand watering. Hand watering is considered to be a high-skill undertaking, requiring attention to detail to achieve even water application while adjusting for difference in crops and stages of growth. 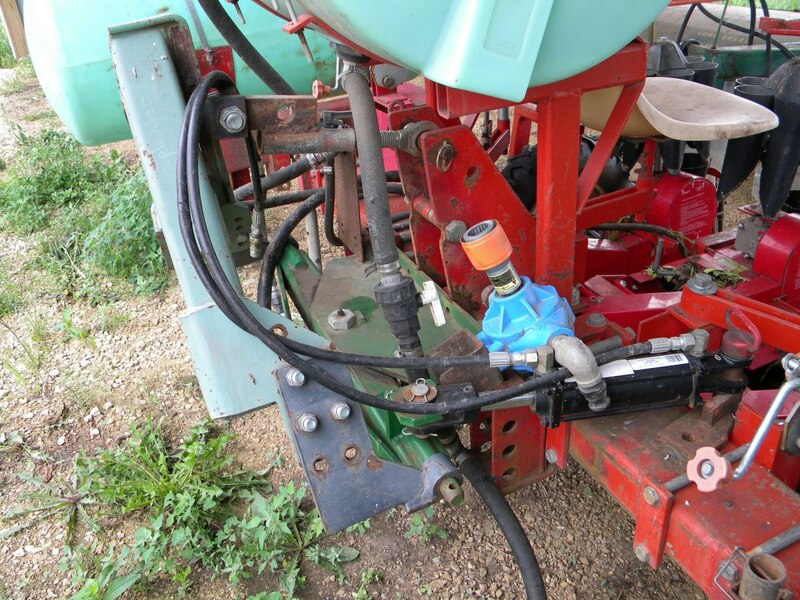 Growers can use a variety of nozzles to break the flow of water. Harmony Valley Farm supplied water to the hoses by means of overhead piping. Supply lines are attached to greenhouse cross braces, and ball valves positioned at the halfway points in the aisles hang overhead to attach the hoses. This reduces the amount of hose dragged along the ground. With fine-mesh breakers, an in-line water filter is an important addition. 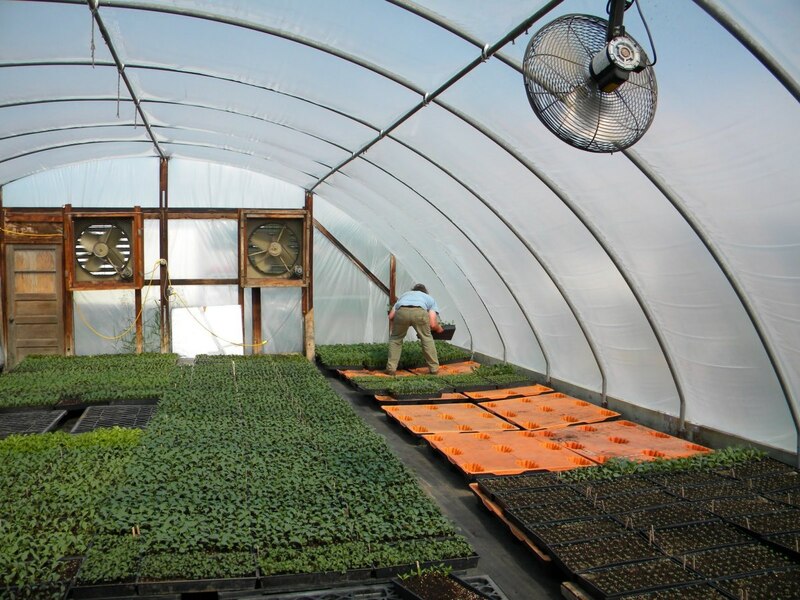 Automatic Systems – Contact a reputable greenhouse supplier for quotes. Stuppy has a long history of working with producers in the Midwest. Nozzles and DRAMM hoses are widely available from sources such as Amazon, Gempler’s, and Johnny’s Selected Seeds. 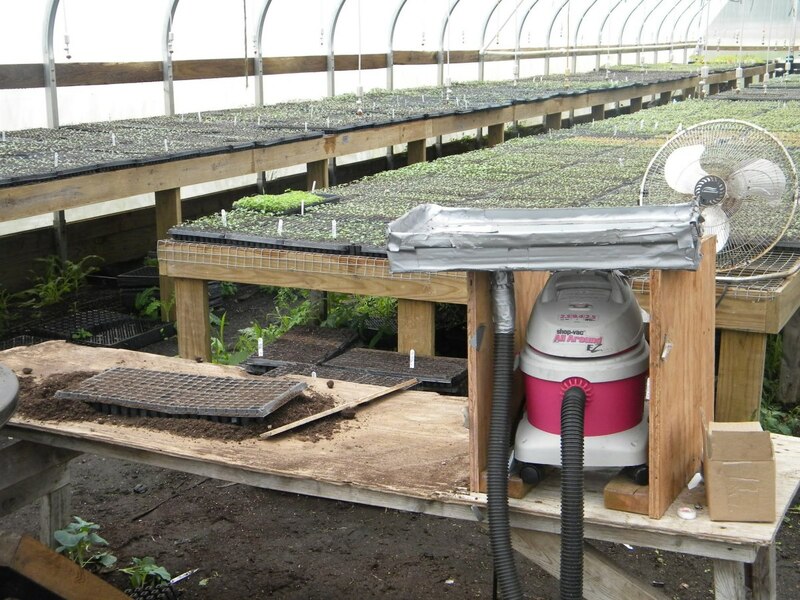 Mechanical 5000 Carousel Planter: To operate the Mechanical 5000, users drop transplant plugs into one of six cups on a rotating feeder. The cup opens and drops the seedling into a shoe. Adjustments on the shoe allow it to fit most cell sizes; the tapered shape of the shoe allows it to precisely position the cell. A cam-activated “kicker” pushes the cell out of the shoe, and a packing skid presses the soil around the plant, closing the furrow. 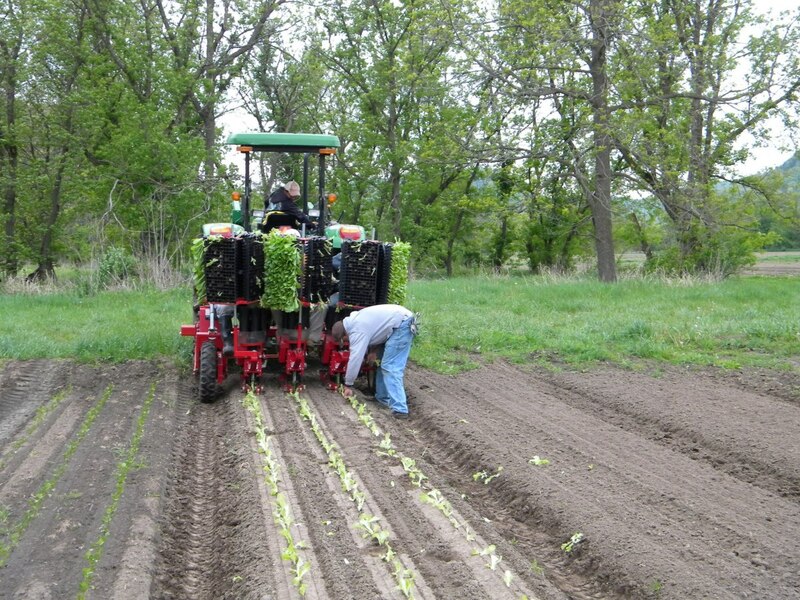 The spacing of the transplants is adjusted using the chain-driven drive system. 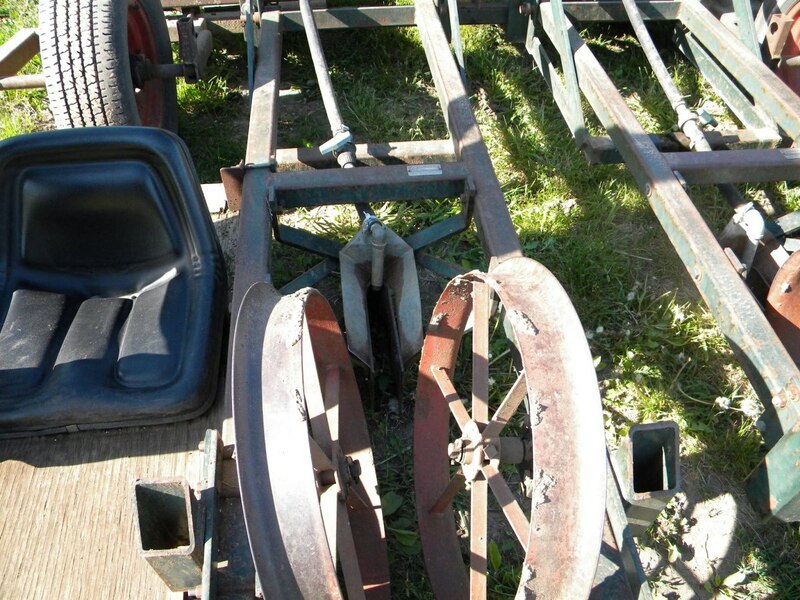 Wheels ride in the tractor wheel track to provide depth control, and to drive the carousels and ejection system. Rows can be spaced as closely as 12 inches. 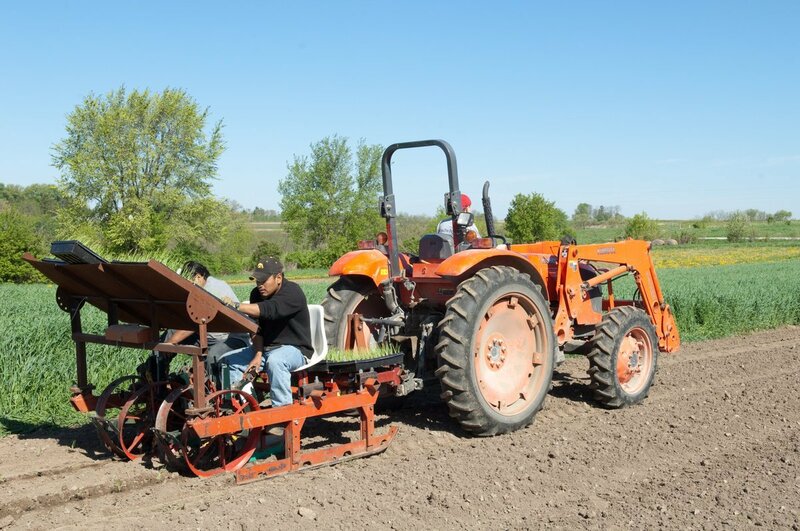 Rates cited by growers were around 1300 plants per hour per row for a three-row transplanter, which comes out to about 4000 plants per hour per worker (one driver, three operators). Because it relies on the structure of the transplant plug to hold the plant in the carousel cup as well as in the shoe, the Mechanical 5000 requires a cell well-filled with roots. The efficiencies that can be achieved in setting out require high-quality, uniform transplants. Costs for a new unit are around $3,235 per row. The drive unit costs $1,875. Toolbars, water tanks, and other options cost additional amounts. Water Wheel Planters are commonly used on plastic mulch. A punch wheel punches through the plastic and fills the resulting hole with water. Plants are set in the holes by hand. Because of this, the water wheel is suitable for use with plants of all sizes and quality. Spacing is determined by the number of spikes attached to the wheel. On bare soil, wheels often cake with mud, and holes in the wheels are subject to plugging. Water wheel planters can be set to transplant very closely between rows. Rates cited for planting with a water wheel are generally about 400 plants per hour per person. Water wheel planters are available from a number of suppliers. Some suppliers offer wheels with removable punches so that spacing can be adjusted. But spacing on a water wheel is not generally as customizable as that on the other planters featured. Two-row planters typically start at about $2,400 for a basic unit. Finger Planter: To use a finger planter, the operator places the plant into a flexible pocket, which carries it down to the planting shoe, where it is released. The pockets travel on a chain-driven belt; spacing is adjusted through the use of sprockets connected to the drive wheels. Once the plant is released by the pocket, packing wheels bury the root ball and pack the soil around it. 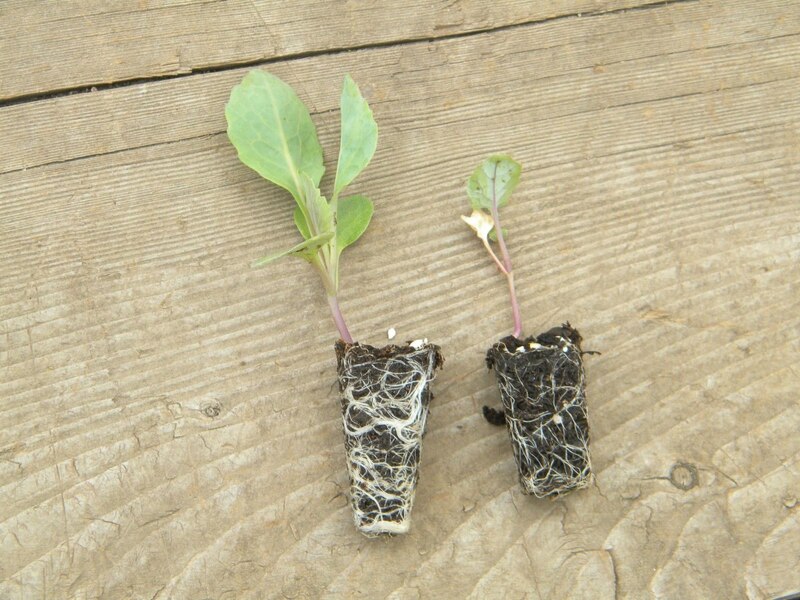 Plants can be bare root or have a cell attached to them; however, these planters cannot handle large cells because they hold the plant rather than the soil. 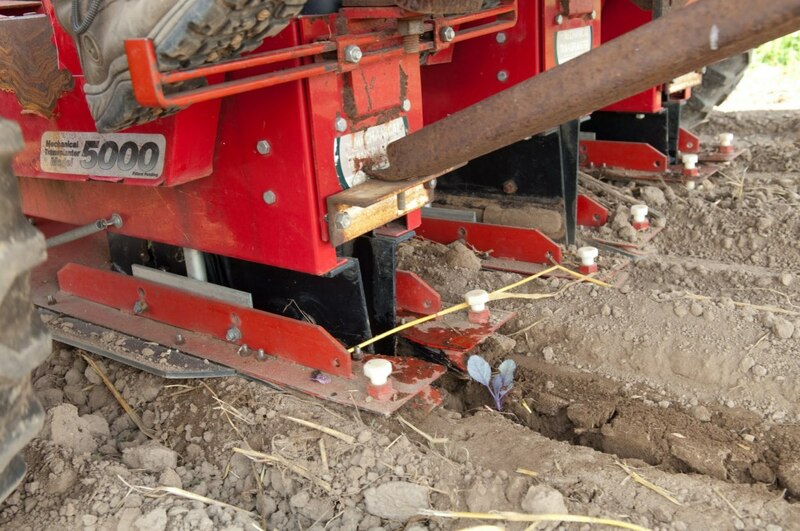 Typical row spacing for a finger-type transplanter is 18 inches and up. In-row spacing can go as low as 6 inches. The 2-row Mechanical 22-C uses the packing wheels to drive the pocket chain. Typical rates of operation average around 600 plants per hour per row. The 22-C costs around $1,500 per row for a new unit; they don’t require an additional drive unit. The Mechanical 1000 uses the same basic technology as the 22-C, except that the pocket belt is driven via chain by a press wheel that travels in front of the opening shoe. This provides a more constant ground contact than the press wheels, and allows each unit to float independently. It also evens the soil for more consistent plant spacing. The Mechanical 1000 costs about $2,250 per row when purchased new. Holland Old Faithful: Plants are hand set into an furrow opened by the shoes; packing wheels then pack the soil in around the plant. 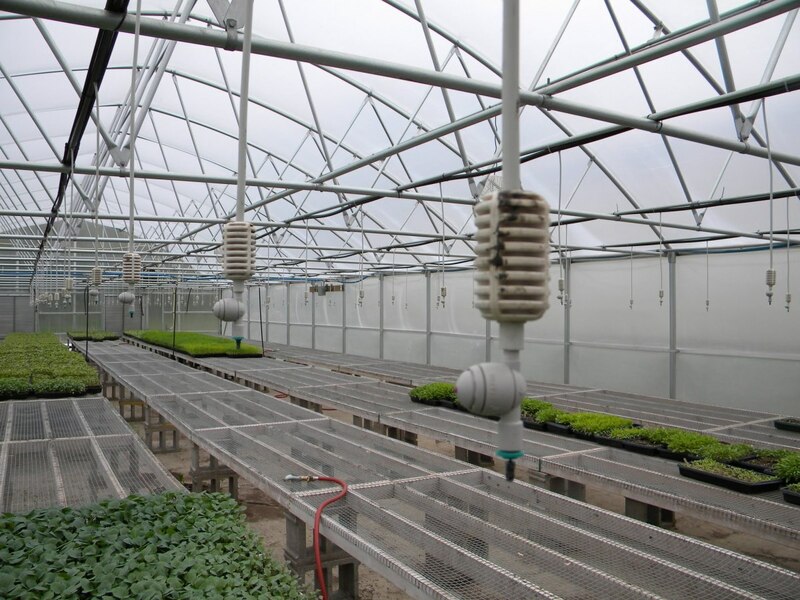 The Old Faithful can manage very large plants, as well as inconsistent plants, and allows the operator to precisely control the depth of each plant. However, it has no mechanism for controlling the spacing; this is done by the operator. An Old Faithful costs about $2,100 per row. Trailed versus mounted transplanters: Trailed transplanters require additional room and maneuvering to turn around at the end of the row. 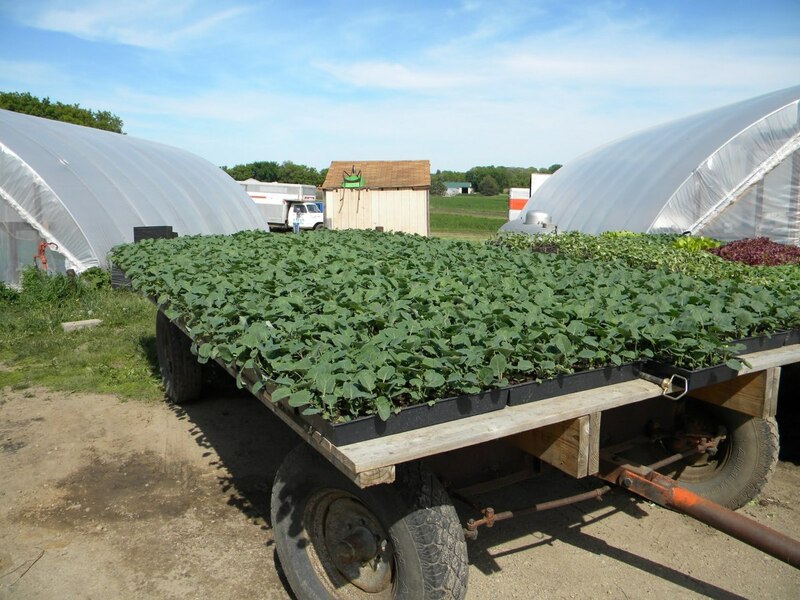 Because the weight of the transplanting water is carried on the trailer, they don’t require a larger tractor, and place less stress on the equipment. The larger volume of water also reduces the number of times the water needs to be replenished in the field. Trailed equipment may also be safer to operate as the risk of tipping is reduced. Trailed machines use a hydraulic ram to raise and lower the transplanting units. 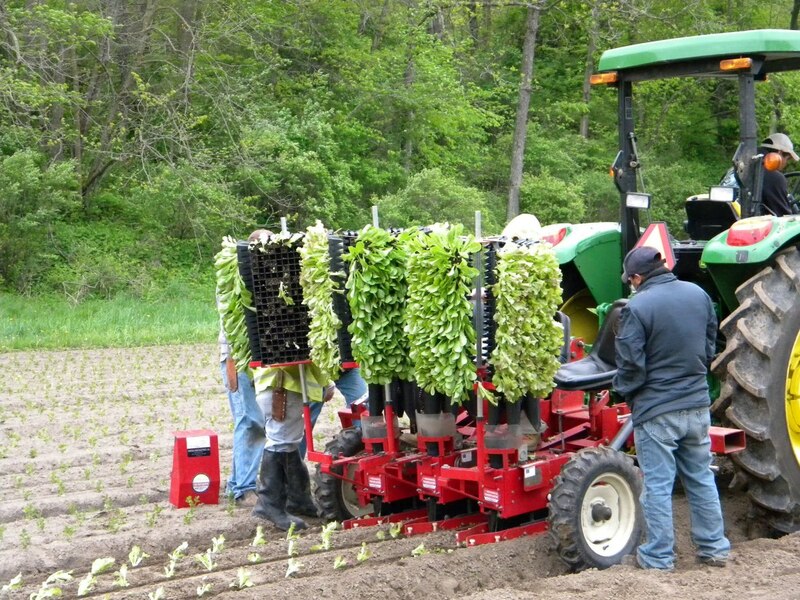 Mounted transplanters can maneuver in tight spaces, but the tractor must be able to accommodate the weight of the water used for transplanting. Operators must be aware of the increased weight, which is usually above the center of gravity for the tractor when the machine is lifted. 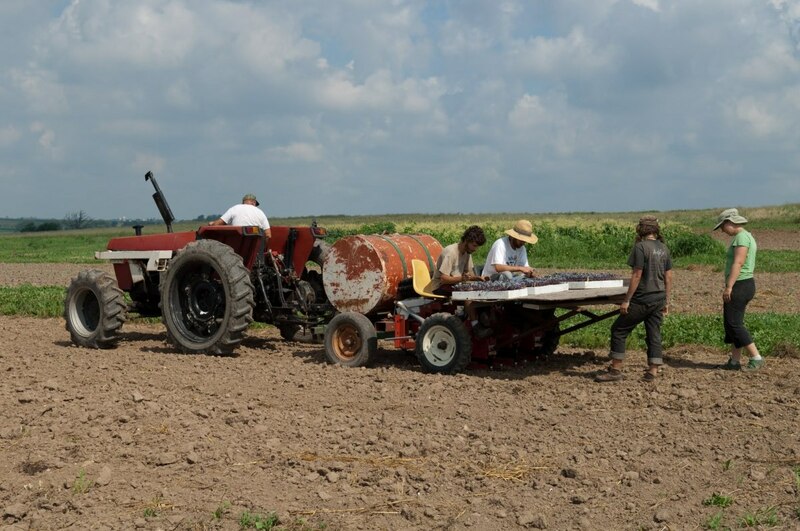 Water tanks can be mounted directly on the tractor frame as well as on the transplanter. 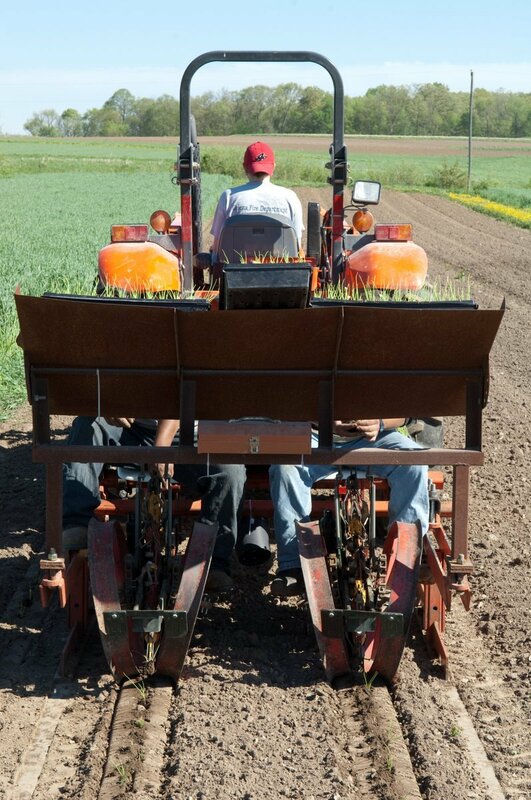 Using a Spotter: Several farms use a “spotter” or a “tucker” to walk behind the transplanting machine. This person monitors machine performance and ensures that plants are set correctly. In addition, they cam fill in gaps that the machine operators missed. Roeters Farm Equipment carries a large line of used and new equipment and can be a good source for used transplanters. Market Farm Implement carries a wide selection of new equipment and has experts willing to guide buyers in their purchases. 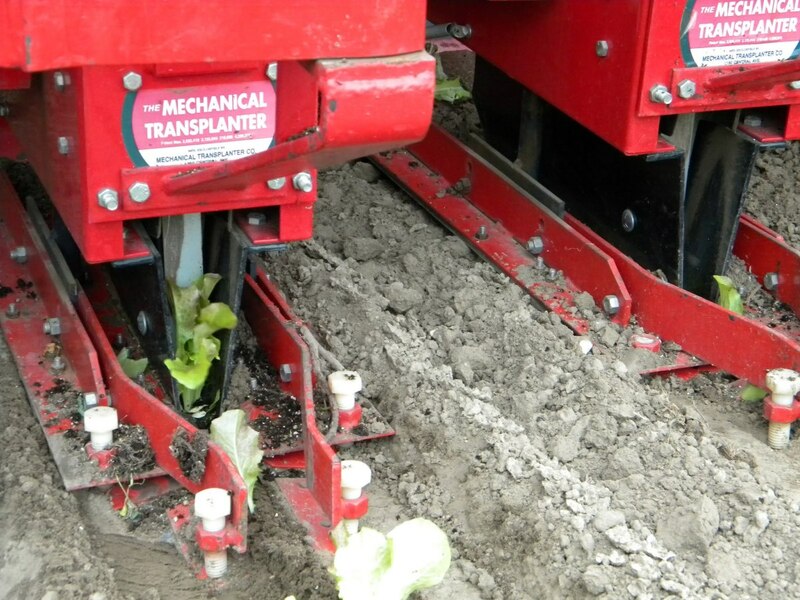 Mechanical Transplanter Company manufactures the 1000, 22C, and 5000 transplanters. 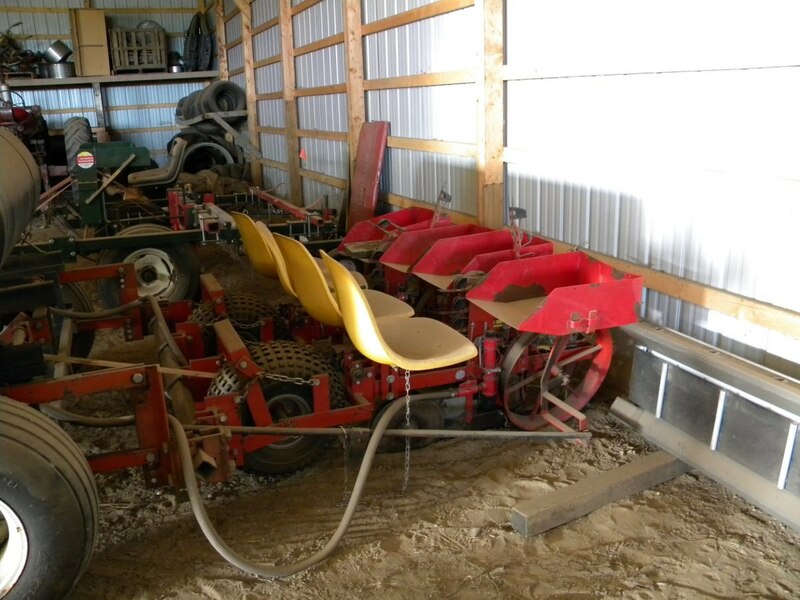 Holland Transplanter manufactures the Old Faithful Transplanter as well as finger-type and carousel planters. RainFlo Irrigation manufactures the industry standard water wheel planter. Buckeye Tractor Company manufactures a water wheel with adjustable spikes.